"Phishing" is an internet scam whereby fraudsters send emails with the intention to collect critical personal and financial information. These "phishing" emails look genuine and appear to be coming from a legitimate bank. They always contain a link to a "spoofed" website asking you to provide an update to, or confirm, sensitive personal information and/or have a warning stating that your card/account has been suspended and that you need to click a 'secure' link to activate or restore your card/account. If you receive an email claiming to be from Citibank asking for your financial or confidential information or stating that your account has been suspended, do not respond. Forward the email to spoof@citicorp.com and then delete it from your inbox. +971 4 3114000 +971 4 3114000 immediately. Re-set your Citibank Online User Name, Password and ATM PIN/TPIN. Update your PC / Smartphone system patches and security software from a trusted vendor (Antivirus, Anti malware and Anti spyware). Be careful when you use a PC at a public place or one not having the latest security software. Always log off by clicking on the "Log Out" / "Sign Out" icon on the Citibank Online website. 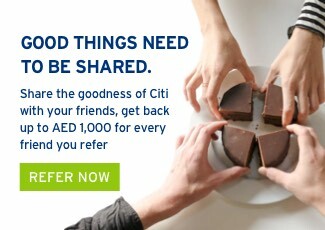 Access your account at Citibank Online by always typing www.citibank.ae directly in the address bar of your browser. Never store your password or account/card information on paper or electronically on word, excel or text documents. Always keep your PC/Smartphone protected with a password/PIN. Citibank will never send you communications asking for confidential or sensitive information like Username, Password, Card or Account number, ATM PIN, Telephone PIN, OTP, Mother's maiden name, Date of Birth. Please note that the U.S. Government has in place sanctions against certain countries, related entities and individuals. Under these sanctions, Citibank N.A. is/will be prohibited from engaging in transactions that may fall within the guidelines of the sanctions and is compelled to reject such transactions and block the related funds. Are you a Citi Credit Card holder?